OnesiesDownUnder is one of the biggest suppliers of DDLG clothing and accessories on the internet, their range of products and designs is absolutely fantastic. Their designs are incredible having so much detail and character. My little loves their products and was delighted to be able to help with this review. They recently sent me three of their Pacifier Clips to review, one for each Pacifier that I recently reviewed and I was blown away with both the quality, functionality and design. So what's so special about these pacifier clips I hear you ask? I suppose you could easily write off a product like this as pretty simple, but the truth is a lot of time and effort has been spent developing these products, and it shows. Firstly they are a generous length while not being too long as to keep getting in the way. Attaching one end to a collar or bib allows it to hang naturally while the little is using his or her pacifier without being hindered by it. You don't notice it is there except for when you drop the pacifier, and it does its job by arresting its fall and keeping it off the floor. These pacifier clips measure 13"/33cm in length which is an excellent size without getting in the way. At one end you have an elasticated loop, and the colour of this loop matches the pacifier clips design giving it a balanced natural look. 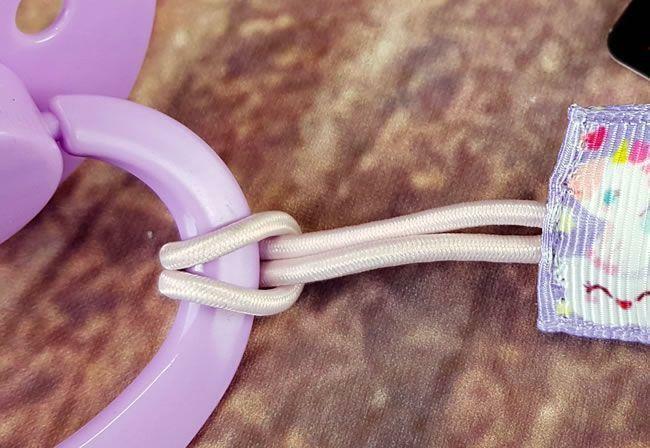 This loop is passed through the pacifiers handle, and then the other end of the pacifier clip is then passed through the loop and once entirely drawn through it attaches to the pacifier securely. It is important that this loop is elasticated and not just cord as if you little catches her retainer on something it will act as a mini shock absorber if it is eleasticated and this will help to prevent any tooth damage. 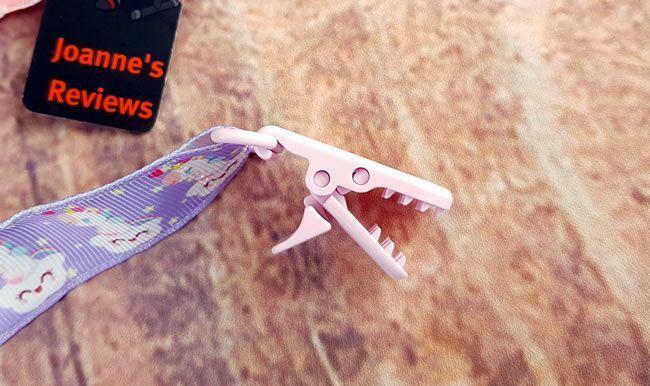 The other end of the pacifier clip features a fantastic little clamp that has three rows of teeth to secure it to clothing. The clamps locking arm is very clever, and I am fascinated by its action. When locked closed, it is exceptionally secure and holds the pacifier clip to clothing very well. To open it up you have actually to lift the locking arm, and then it springs open, allowing the jaws to open wide. It's such a simple action, but for some reason, it mesmerised me. Yes, I know, I probably need to get out more often. The jaws and teeth really hold the pacifier retainer to anything that you clamp it to well. 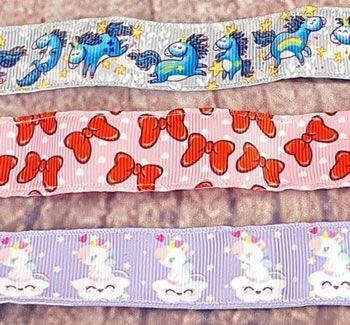 There is a fantastic thirty-one different designs of pacifier retainers at the time of writing this review, and the three featured in these pics are Dreamy, Sweathearts and Unicorns. The Unicorns design is a favourite of mine as the unicorns in it have so much character, and let's face it, who doesn't love unicorns? Each pacifier clip matches one of the designs of onesies and twosies that I am also currently reviewing. One of the beautiful things about buying onesies and twosies from OnesiesDownUnder is the fact that you can get matching bibs and pacifier retainers to create a matching outfit for your little. Having matching clothing and accessories matters for some and these pacifier retainers look fantastic when clipped to my little and she loves using them. Now obviously you don't have to have everything matching in your littles outfit, and that's great too as it means that you have 31 choices to choose from so you are bound to find something to please you or your little at OnesiesDownUnder. These pacifiers are double sided, with both sides featuring the same high-quality design with colours that really pop. The two pieces of strong patterned material are stitched together very neatly, in fact, the stitching is hard to see as it is so tight and neat. There is extra stitching at either end to securely hold the elasticated loop and clamp mechanism securely in place. The quality of these pacifier retainers is fantastic. Basically, these pacifier retainers are bulletproof, their sturdy construction will give you years of faithful service while the fantastic array of designs means they will continue putting a smile on any little's face for a long time to come. "I like my diddy retainers as it means when I drop my diddy it doesn't fall on the floor to get coated in nasty germs and fluff. I sometimes lose concentration when I am sucking on a diddy especially when doing something I love like colouring or watching cartoons and sometimes I spit my diddy out by accident. This diddy holder means that it is always close to hand to put back in my mouth quickly. 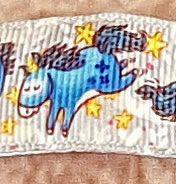 I also love the designs, the unicorn one is my favourite." The pacifier retainer are washing machine safe and so can be thrown into the wash with the rest of your little's clothing, this makes cleaning spills and stains a doddle. 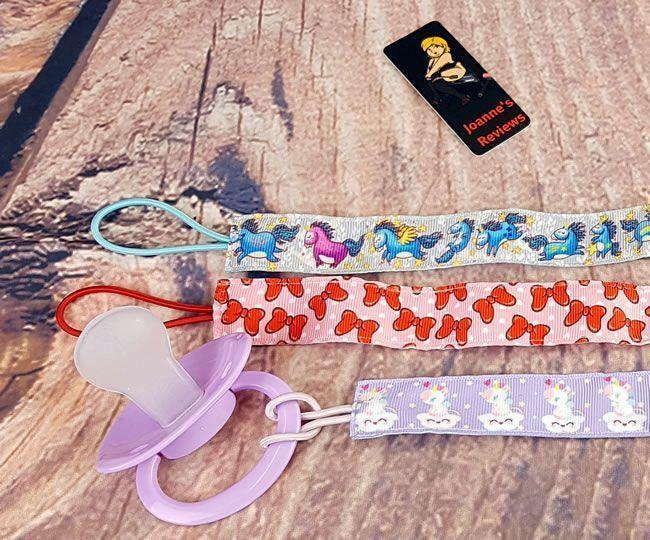 These pacifier clips are fantastic quality, and there are some incredible designs to choose from down at OnesiesDownUnder. Each one costs just £5.58 which is very reasonable, and they do the job that they were designed to do admirably. I was impressed by the quality and thought that went into their design, and my little loves them. They have already prevented lots of unwanted diddies on the floor problems. Whenever she accidentally spits her diddy out now, she no longer panics but simply reaches down and retrieves it before popping it back into her mouth and carrying on what she was doing. I have some other things that I am reviewing for OnesiesDownUnder, and while I am not going to let too much out of the bag at this stage, the quality is fantastic. I have no hesitation in giving these pacifier retainers a strong recommendation to anyone looking for a safe and robust solution to the problem of dropping pacifiers. I was sent these Pacifier Retainers by OnesiesDownUnder and I would like to thank them for giving me the opportunity to review them. Grab one or more of these fantastic pacifier retainers from OnesiesDownUnder for just £5.58 and that is good value for money. The range of designs in fantastic with thirty-one to choose from. Check out the fantastic designs of their Onesies, Twosies and bibs as well. I have no problem in giving OnesiesDownUnder a huge thumbs up and a strong recommendation for anyone in the DDLG or ABDL scenes.